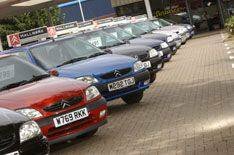 Used car sales slump | What Car? Tumbling used car prices have been blamed for a 37% fall in profits at Britain's largest car dealership group, Pendragon. A Pendragon statement said that wholesale used car prices witnessed 'the biggest single monthly reduction in over five years in June. The drop-off was particularly marked for large executive and off-road vehicles. However, while private sector registrations fell by 4.9% in the first six months of 2008, demand for company cars increased by 2%. Despite this, though, the company still made 21.1 million pre-tax profit. In the first six months of last year it made 33.5 million.